Three species of lamprey occur in Ireland; the brook lamprey Lampetra planeri, the river lamprey Lampetra fluviatilis and the sea lamprey Petromyzon marinus. The lampreys (family Petromyzonidae) belong to a small but important group known as Agnatha (jawless fish), the most primitive of all living vertebrates. They are eel-shaped but there the similarities between eels and lampreys end. Unlike eels, lampreys have no jaws or bones with all their skeletal structures consisting of cartilage. Moreover, Lampreys have no scales or paired fins. Their mouth is a sucking disc and they have distinct eyes, seven gill pores on each side of their body, a single nostril at the top of their heads, with fins running along their back and surrounding their tail. The three Irish lamprey species are of high conservation value and are all listed under Annex II of the European Union Habitats Directive. All three lamprey species are also listed on Appendix III of the Bern Convention (1979). The life cycle of the three species varies, but all have an extended sedentary larval stage during which the juvenile lamprey (known as ammocoetes) live as burrowing filter-feeders in depositing areas of watercourses for up to five years or more. Following this they metamorphose into adults. Sea and river lampreys have an anadromous life-cycle, which means they go to the sea to feed as young adults but return to rivers to spawn. While at sea they are ‘hematophagous parasites’ of other fish – they attach to fish using their mouths and feed on the blood and tissues of the host. 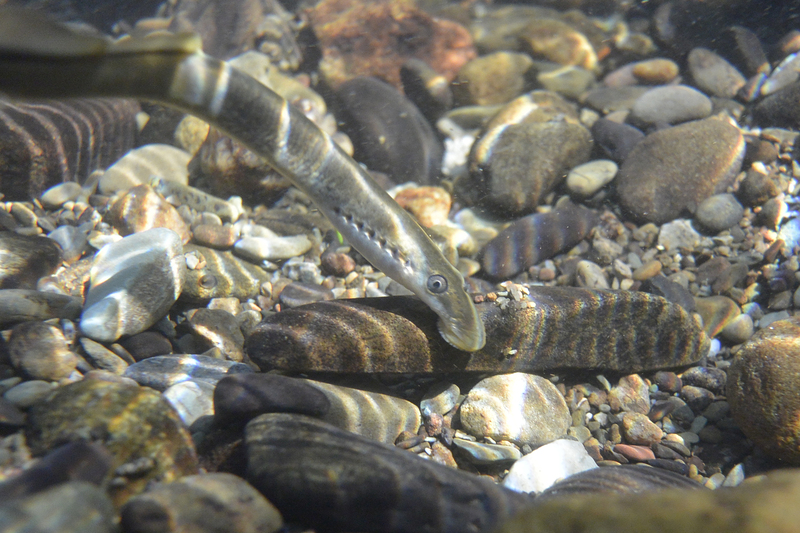 Brook lampreys only undertake localised migrations and do not feed as adults. River lampreys are thought to feed mainly in estuaries, while sea lampreys will travel further out to sea. After an unknown period in the marine environment – perhaps up to two years – anadromous lampreys will return to rivers to spawn. The spawning takes place in the spring and early summer period in often the same habitats where salmon and trout spawn. Unlike salmon, lampreys do not necessarily enter their natal rivers to spawn. Instead it is thought that they will be attracted into rivers by the pheromones releases from juveniles. Lampreys are an important element in river ecosystems. The key importance of lampreys is the fact that, together with the hagfishes, they are the sole survivors of the agnathan (jawless) stage in vertebrate evolution. Lampreys have left a poor fossil record but it is known that they have been present since at least since the Devonian period (400 million years ago). Lampreys are of high ecological value and can play an important role in processing nutrients, nutrient storage, and nutrient cycling in streams. Moreover, they also constitute a food source for other animals and can act as a buffer for salmon from predators in areas where they are abundant. They are considered to be ‘ecosystem engineers’ and their nest-building activities can shape river channels and create habitats for other species – including maintaining and extending spawning habitats for salmon and trout (which use these areas in the winter months). It is now understood that they are susceptible to the same threats facing other native freshwater fish (i.e. pollution, barriers to migration, habitat destruction). Like all fish species, lampreys and their habitats are vulnerable to water pollution. Ammocoetes (larvae) are relatively immobile in the substrate and tend to concentrate in areas that include many age classes making them very susceptible to pollution. The physical destruction of juvenile lamprey habitat is also a major factor in the decline of lamprey populations. Much of this loss can be attributed to the dredging and channelization of rivers. Any projects in rivers that change flow patterns, alter the gravels of stream bottoms, and decrease habitat complexity can also negatively affect lampreys. In the longer-term, river channelization negatively impacts larval lamprey habitat by reducing the areas of natural silt sediment due to high river flows. Lampreys are poor swimmers and cannot jump like salmon or climb like eels. Therefore, they can be severely impacted by the presence of even small weirs and dams in rivers. Indeed, in most rivers in Ireland anadromous lampreys are confined to the lower reaches of rivers. 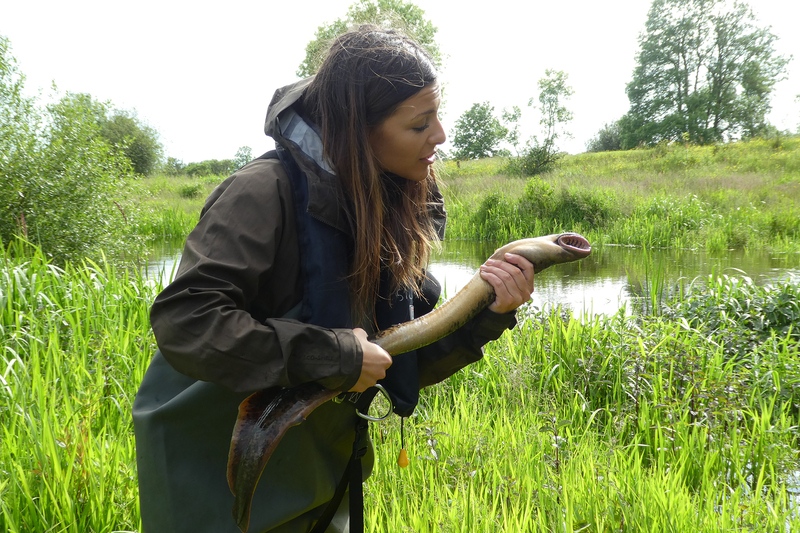 Even though these primitive fish share many of the same habitats as salmon and trout – and can bring many benefits to these fish – lampreys have received little attention in Ireland. On rivers like the Shannon, lampreys have been severely impacted on by dams and weirs, river regulation, channelization, canalisation, flood schemes and water quality decline. Migratory lampreys are now almost completely confined to below the Shannon dams, with their migration into tributaries of the old river impeded by weirs. Migratory lampreys are rare in the Corrib catchment, with their migration into Lough Corrib blocked by the Galway barrage and all spawning and nursery habitat downstream of the weir removed by drainage works. On rivers like the Boyne and Barrow – also protected areas for lampreys – a series of weirs built to make the rivers navigable continue to act as lamprey migration barriers. 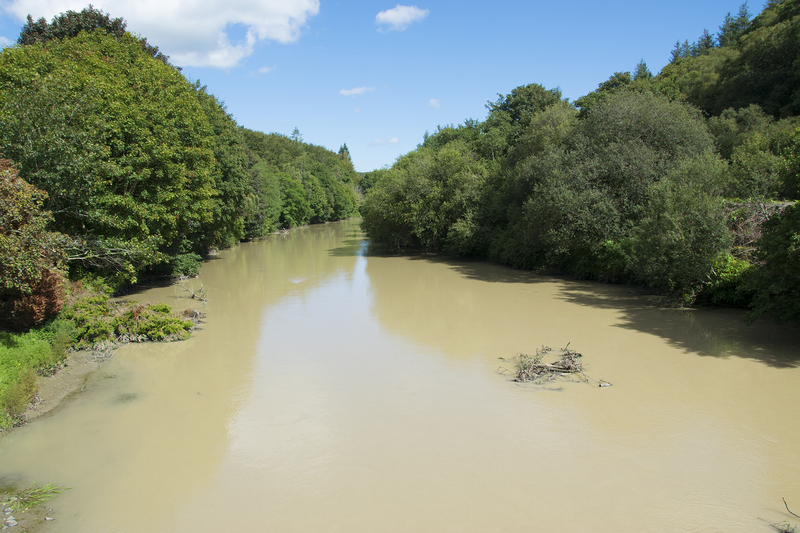 Suspended solids pollution on the River Bandon downstream of the Flood Scheme works during August 2017. At the time of preparing this article major dredging works were ongoing in the river Bandon, Co Cork. Unlike many rivers in Ireland there are no weirs or other barriers in the lower reaches of the Bandon and river lampreys could previously run right up to the weir in Bandon town. This stretch of river was relatively unmodified in the past and held one of the best river lamprey populations in Ireland. During May 2017, major dredging works commenced here during the river lamprey spawning season – disrupting spawning lampreys and removing possibly tens of thousands of larval lampreys in the dredged spoil. Although dredging can be required to maintain navigation schemes, there is a growing awareness that dredging rivers may not be helpful in relation to increasing flood conveyance, and may even be counter-productive. Dredging can make river banks prone to erosion, and hence stimulate a further build-up of silt, exacerbating rather than improving problems with water conveyance capacity. The flooding at Bandon should have been addressed by a sustainable catchment-based flood management approach. River restoration works in Ireland are almost exclusively focused on salmon and trout, usually to the detriment of lamprey habitats. 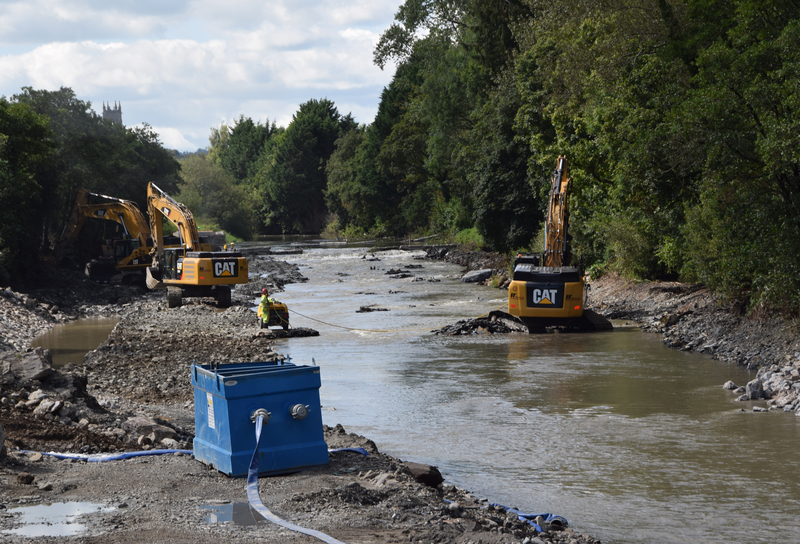 In-filling rivers with rocks and boulders removes lamprey nursery habitats. When the banks of rivers are armoured with riprap and other hard engineering measures (as proposed on the Bandon) the rivers energy is directed downwards which can result in spawning gravels becoming compacted – which of course also impacts on salmon and trout. In Ireland, we need to move away from ‘fisheries development’ to ‘river restoration’ to benefit all the ecological interests in a river channel. 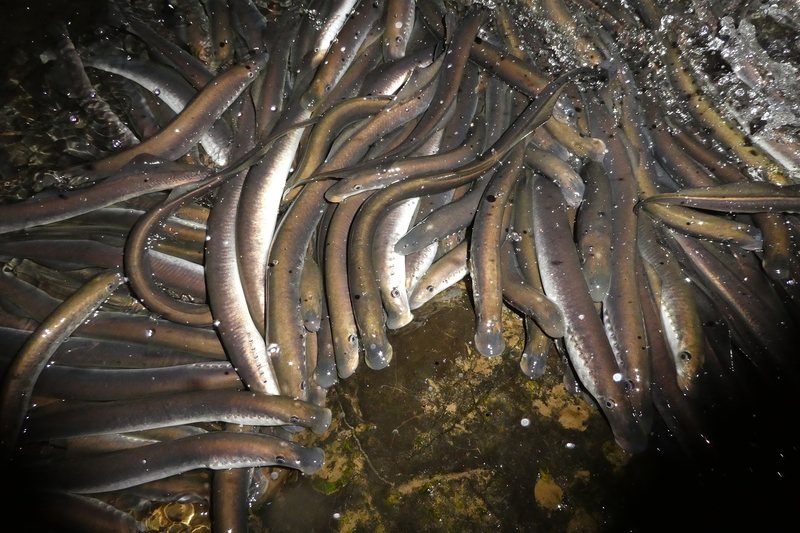 There is also an ongoing conflict between salmon census and protection of the other conservation interests in Irish rivers – crump weirs block lamprey (and eel) migrations. In May 2017 Inland Fisheries Ireland opened a fish counter on the River Lackagh in Donegal. The counter was described as “innovative” in their press release. Indeed, so innovative that it lacked both a lamprey pass, and one for the critically endangered European eel. River Lampreys trapped below Annacotty weir, Spring 2017. Despite a recent €1.75m EU LIFE project on the River Mulkear, Co Limerick, which had a stated aim to restore the lower River Shannon Special Area of Conservation, little progress was made in relation to assisting lampreys in this catchment. In March 2017, I found thousands of river lampreys trapped below Annacotty weir in the lower reaches of the river. These lampreys are unable to ascend this weir, and cannot use the experimental lamprey pass which was installed here as part of the Mulkear LIFE project. Although I initially set out to expose the fish passage problems at this site, I also unexpectedly uncovered a major lamprey poaching problem here. Lampreys are used as fishing baits and frozen lamprey sections can sell for up to €2 each to pike anglers. 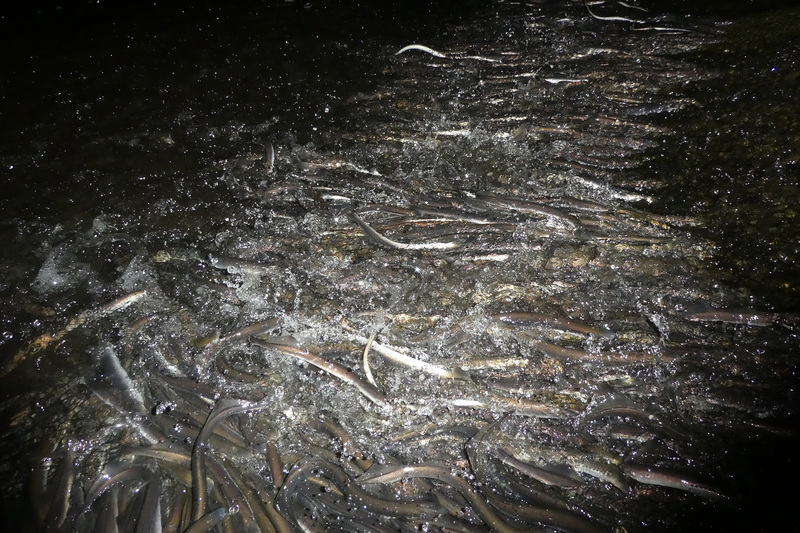 The impact of this illegal bait collection on lampreys is likely to be significant and it is of concern that gangs of poachers were openly collecting lampreys on the River Mulkear in Annacotty village during March 2017, apparently without fear of prosecution. While there is still much to be learned about lamprey distribution and abundance, the need for conservation of lampreys is evident. Until recently, lampreys were widely distributed in aquatic systems throughout much of Europe but a considerable decline in lamprey populations has been observed in recent decades. Ireland still retains extensive lamprey populations and could play an important role in the conservation of these species in Europe. I was delighted to work recently with BBC Earth on a documentary on Sea Lampreys. The filming took place during early-June 2017 on the Old River Shannon at Castleconnell, Co Limerick. This is part of the Lower River Shannon Special Area of Conservation, and sea lampreys are a key conservation interest of this Natura 2000 site. This video is now available to view below.